Looks like the end of the road for Tom Brady after giant defeat -- Eli Manning the new successor as Super Bowl great? Is it the end of the road for Tom Brady? In the end all quarterbacks reach that moment that Brady reached on Sunday night, his despairing pass into the end zone left the Patriots an agonizing touchdown short of victory. At 35 when next season starts Brady knows it will not be easy to get back to the Big Show, that his skills will inevitably diminish. Because of his courage standing in the pocket all those years he has plenty of miles on the clock. He was outplayed by Eli Manning when it really mattered last night. The new hero is Eli Manning who clearly lived up to his early season boast that he considered himself an elite quarterback. After two MVP performances in two Super Bowls who can blame him? Manning like he did in 2007 and like Brady of old, drove his team the length of the field almost for the winning touchdown. On the previous play Brady, admittedly aided by a dreadful dropped pass by Wes Welker, could not close out the game. That is how it goes in this the game of football. 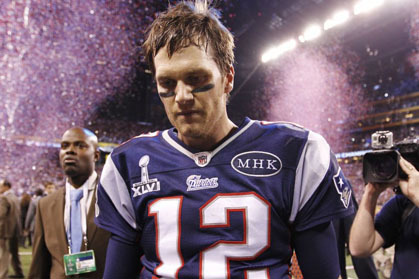 Brady was magnanimous in defeat but it must have pained him to come so close and yet be so far. This is a guy remember, who has admitted he has never looked at the 2007 Super Bowl tape when the Giants defeated the Patriots last time. It looks like now he will hover on the verge of the nearly greats to have played the game, not quite up there with his idol Joe Montana who was 4-0 in four super bowls and Terry Bradshaw who was also 4-0. At 3-2 wins and losses Brady is a notch below. Indeed, Eli might be the one to match Montana and Bradshaw, he is relatively young, just turned 30 and has many years left. Ironic that Brady came into this Super Bowl on his way to history but was derailed and Manning can now make tracks in that direction. As for the Boston fans they are downright dismissive of Brady which is hardly fair. Here's what Boston Globe columnist Eric Wilbur wrote after the game "The legend is dead, the prince has turned back into a frog, and...well, use whatever other cliché you want. A performance as bad as Tom Brady's tonight in Super Bowl XLVI deserves a lead just as lame. "Sorry, Tommy Boy, this one's on you. Your hideous performance led to the Giants' 21-17 Super Bowl title win. How embarrassing for your coach, your teammates, and your fans." Tough crowd to please in Beantown. You win 'em three Super Bowls, compete in two more and they just want to forget all that.